Singer Katy Perry and ex-husband Russell Brand are being used as bait for a new worm making the rounds of social networking giant Facebook, a computer security firm warned. Panda Security said the cyber-criminals behind this latest Facebook malware are attempting to turn users’ curiosity and interest in celebrities against them. “Once again, user curiosity becomes cyber-criminals’ best ally. Scammers exploit people’s interest in celebrities to infect users. We have recently detected a new Facebook scam that uses a fake video of singer Katy Perry and ex-husband actor Russell Brand to trick users,” it said in a blog post. 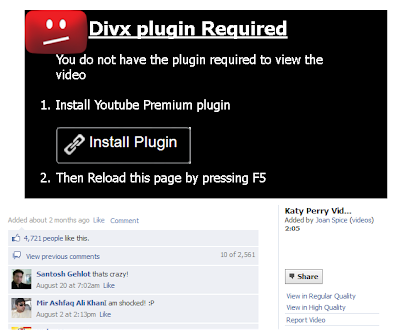 It said a user who clicks on the link claiming to lead to the video will be taken to a fake Facebook page where he or she is invited to download a plug-in to watch the video. Panda Security said the page shows more than 4,000 people have already clicked the “Like” button, which it said is used by the scammers to trick victims into believing that the video is legitimate. “If the user tries to play the video, the worm will act differently depending on the browser used. If you use Firefox or Chrome, the worm installs a browser plug-in and uses it to post the scam to the victims’ friends’ pages. On Internet Explorer, the worm displays an age verification page to access an application called ‘X-Ray Scanner,’” it said. But before the user can take further action, the browser takes them to a typical scam site where he or she is asked to enter his or her phone number. Giving away the phone number may spell financial trouble for the user, who will start receiving unwanted premium rate text messages. Be wary of websites offering sensational videos or unusual stories. Before you click on a link sent by one of your contacts, make sure it has been intentionally sent by your friend and it is not the result of a massive scam like this one. Don’t accept friend requests from people you don’t know. This will help keep your privacy safe. Check your browser plug-ins and remove any suspicious ones. Check the applications that have permission to access your Facebook account, and delete those you don’t know. Change your Facebook account password. If you use the same credentials to sign in to other services as well, change them too. It is always better to take all necessary precautions.